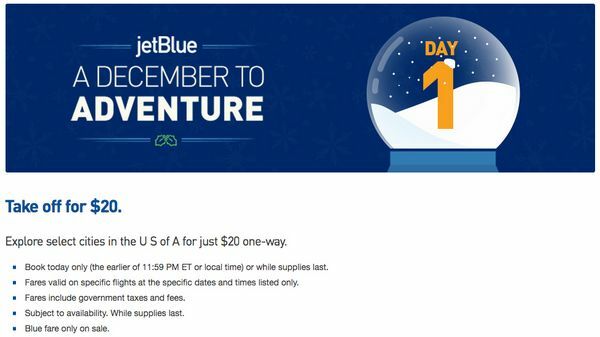 $20 Flights (400 Points One-Way) With Today’s JetBlue December Deals! Via Deals We Like, through December 16, 2016, JetBlue is offering 12 days of deals with their “A December to Adventure” promotion! Today only, you can book JetBlue flights between certain US cities for just $20 one-way, or 400 JetBlue points! These low fares are valid on specific dates only. The deals launch daily at 1:00 pm Eastern. And we’ll share the best ones with you! Shake the Virtual Snow Globe to See the JetBlue Daily Deal! Let’s take a look at today’s deal! Today’s deal from JetBlue’s “A December to Adventure” promotion is now live, and they’re offering $20 one-way fares between select cities (or 400 JetBlue points) like Boston and Washington, DC, New York (JFK) and New Orleans, San Francisco and Las Vegas, and more! You can check here to find a full list of valid routes and travel dates. But you MUST book by 11:59 pm Eastern Time TODAY, December 5, 2016. Book Today, December 5, 2016, and Pay Just $20 One-Way for Flights Between Select Cities in the US! So if one of the routes on the list fits your travel plans, taking advantage of this deal could save you lots of money (or points!). For example, you can fly from Buffalo to Los Angeles (a ~5 hour flight!) for $20 or 400 JetBlue points on December 10, 2016. Or Boston to Las Vegas on December 12, 2016, for the same price! Note: Some folks NOT in the Eastern time zone are having difficulty accessing the “A December to Adventure” promotion site. So go through this link to take advantage of today’s deal. With the JetBlue Plus and JetBlue Business cards, you can earn 30,000 JetBlue points (worth ~$420 in JetBlue flights) after you spend $1,000 in the first 90 days of opening your account. The $99 annual fee is NOT waived for the first year on either card. But the free checked bag perk, anniversary point bonus, 50% discount on in-flight purchases, $100 statement credit on vacation packages, and 10% redemption point rebate can easily make up for that. So if you fly JetBlue a lot and want to earn more JetBlue points, either of these cards would be great options. There’s also the regular JetBlue card, but it only comes with a 5,000 JetBlue point sign-up bonus. Which isn’t really worth it! And don’t forget, if you’re looking to earn even more JetBlue points, you can earn 3X JetBlue points when you shop at Amazon through JetBlue’s link! On top of the rewards you’ll earn from the credit card you use. Just in time for the holiday shopping season! Here’s my post about getting Big Travel with the JetBlue cards. Using JetBlue points is convenient because there are no blackout dates. But the price of an award ticket is tied to the paid cost of the flight. So you’ll pay more points for expensive tickets, and fewer if there’s a seat sale. With today’s deal from JetBlue’s “A December to Adventure” promotion, select routes and dates are just $20 one-way (400 JetBlue points)! So check to see if you can find a ticket that fits your travel plans. This promotion runs through December 16, 2016. And the deals will be released daily at 1:00 pm EasternTime! So check back to see how you can save over the next ~2 weeks. Let me know if you book a trip!